Ok, not the post you think it is.. All other things being equal, The Mod 3 with L3 filmless WP tubes shows more. (though things are not alway equal as you will see when you read this). This is really a post about the devices themselves and the pros and cons of each. A night vision binocular is a very expensive propostion and if you think you want one, I am going to tell you that there is more to it than one would think at first blush. Fisrt, the total cost of running this kind of rig is far more than the cost of the device. Consider that you need two of everything you use with your PVS-7. This means two filter adapters, two afocal lenses, two long pass filters, to H-a filters, two CCD hinder lenses, two eyepiece barrels, and well, two of whatever. Then there is the mechanics of re configuring. Not only to you have to buy two of everything, but now you wind up having to manage all of these little parts, and worse than that, the act of re configuring from ENVIS/3x to the CCD finder or SLR lens (which is problematic for the binocular because of IPD limits. Now add to this the complication of doing this with all of the small parts in the dark.. Of course that is crazy, now you need to have a light source, and I do this in the hatch bay of the car. There are just to many little pieces and the treading and threading all of this stuff is tedious. Then there is focus and gain.. While it is very nice to have gain control, when using the CCD lens, you have to refocus with filter changes and because the fitlers usualy want full gain but the long pass often like less gain, there is a lot of adjusting that has to be done. By comparison, the PVS-7 is inexpensive both as a device, and in the fact that you don;t need so may duplicates. But more than that, the PVS-7 is just far easier to use and reconfigure. The PVS-7 does not impose an IPD restcition on the use of SLR lenses, so you have a vast range of lenses you can use. While I can cpmpare how the PVS-7 and the Mod 3 look when using the 50mm CCD finders at f/3.8, what would happen if I used an f/2 200mm SLR lens on the PVS-7? For half the price of a Mod 3, I could buy a good PVS-7 and stuff a really fast 200mm Apo SLR lens on it and then what would be the outcome? See, the PVS-7 gets the benefit of being able to use lenses that the Mod 3 simply can't exploit and we all know that NV likes a fast lens (all other things being equal) and this is an area where the Mod 3 falls painfully behind. When compared apples to apples, the Mod 3 will almost always win, but when compared apples to f/2 lenses, don't look for a convincing victory from the Mod 3. And then there is telescope use. Lets face it if you love using both eyes, then taking a Mod 3 pod and sticking it in a telescope takes a big chunk of the value proportion of a binocular and throws it out of the window. (A note here. Even a single pod used in the telescope will show more than the PVS-7 does in a telescope. These tubes are amazing.. But if you like using two eyes, then it is hard to get past the fact that you can't do it with the Mod 3 in any kind of normal telescope). Now, don't get me wrong.. I love love love love love my Mod 3. When the dust settles though, the battle does not have a decisive winner to me. The PVS-7 simply has an ease of use and a broad range of flexibility that the Mod 3 simply cannot match, and it is difficult to put a price on that even when it comes to performance improvements. I have a 200mm F/2.8 lens and it is my intention to compare the views using the Mod 3 with the CCD lenses but that is a different post for a different day. My bet though is that given the ability to put a really fast lens on the PVS-7, some of the performance advantage of the Mod 3 will be eroded. Sadly my f/2.8 lens is not the best and I wish I had something like Jay uses to do the comparison, but you get the idea. For less than the cost of a Mod 3, you might find that a feally high quality SLR lens would allow a PVS-7 to equal the nebula performance of the Mod 3 using its smaller, slower finder lenses. I am lucky.. I can afford both a PVS-7 and Mod 3, so I can use my PVS-7 for telescope and higer power hand held viewing with faster lenses, but for those on a tight budget, a monocular and a goggle might be a better balance. Just food for thought. I am sure that some might envy me for having a Mod 3, but until you really look at the compromises, you should not be so quick to do so. If your budget allows and you want the ultimate low power experience, then grab a NV binocular for sure, but don't feel all that bad if you don't and instead use a monocular and PVS-7. I still use my PVS-7 a great deal and I do that because I like using two eyes whenever possible and the Mod 3 is very limited in the way it can be employed while using both eyes. Hope someone finds this interesting. Edited by Eddgie, 28 September 2016 - 11:13 AM. I do find it interesting that you mention that narrowband filters need gain all up and longpass you then can turn down. With my Gen 3 PVS-4's, I turn down the gain on narrowband and it actually enhances the contrast by reducing noise. There is absolutely no benefit in my PVS-4 to having gain on full. The noise introduced at highest gain setting plus the gain it brings in for skyglow (even in narrowband) reduces contrast that easily can be seen by just turning down gain a hair from full. I have done many comparisons between tubes that can vary in PCR and S/N and in each instance, I found the same objects viewable, but the details in the higher PCR and S/N tubes were not fighting with heavier scintillation, halo, EBI, so they provided a cleaner view even though I could still see all the same objects. Examples of S/N differences were two MX10130 tubes in my PVS-7, one having thick film S/N of 21, halo 1.5, resolution 64 lp/mm vs thin film 27.8 S/N, halo of .7, resolution of 72 lp/mm. In each case, longpass views always show very little noise and the higher specs make less difference in short FL scopes, but noise can increase even in longpass with my mak at F/12 and there the higher spec tubes show a cleaner view than lower spec. The same objects viewed through high spec 18mm tubes can be seen in my PVS-4 gen 3's, but they can appear slightly brighter with more scintillation than 25mm tube with gain turned down a hair. The tradeoff off appears to be equal to me, but really like the expanded FOV in PVS-4's, plus one PVS-4 is a biocular and I get the two eyed benefit with all the clarity of a monocular. That and cleaner image with the adjustable gain. Downside is weight of the PVS-4's. Maybe three times the weight of a Micro. In regards to PVS-7 vs Monocular (even monocular with large biocular magnifier), as noted by several people, I too notice a clarity level in the monocular that is not present in the PVS-7 due to the bifurcated optical path, but again, the monocular provided a cleaner view, even though I could still see all the same objects. While I advocate using night vision for astronomy, the costs associated are high. Not everyone is ready to plunge into a high spec tube or binocular device with double costs for everything. This is obvious by apprehensive posts on paying that much, but if you are limited by funds and still want to get that lower spec device, if a gen 3 with reasonable specs (I was seeing all the faint stuff with 21 S/N), then you will still get some immense benefit to astronomy even with very narrowband (used 7nm and 3nm still with 21 S/N devices) filters. The issue then becomes just like all the other equipment related to astronomy - how much better will I like a high spec tube and the cost will be quite a bit more than the cost of the lower spec device unless you happen upon an amazing deal. So then you pay twice. So the dillemma is this: do you pay mor later and wait or do you buy for lower cost to start using it sooner. The journey to your gear is different for everyone. After all is said and done (for the moment) with my equipment, I could have just used the 21 S/N pvs-7 for many more years as my only device, but curiosity and having the funds to explore more gave me a broad experience which I found value in. I enjoy my various devices, but all said and done and a pvs-7 plus my 120 ST would have been a treat all in itself as an only instrument. My goal for NV originally was to see the horsehead neb and similarly faint objects like North America Neb, Rosette, California, Crescent, Cat's Paw, etc and that old thick film tubed pvs-7 did it all on larger objects. Even to the point of the brighter globs being seen with barlow on the 120ST. Nice to see an advocation for astronomy purposes. Unfortunately the PVS-14's tube is recessed enough that some may find it difficult to obtain infinity focus in a telescope. C-mount ready or PVS-7's with adapter available are great though. I should probably mention that the binocular cost is substantial enough that I could have bought a L3 filmless WP mod 3 binocular for slightly less than I paid for six gen 3 devices and two gen 2 devices. That is something, But c-mount ready binoculars not available back when I started and noone can be sure of ther observing preferences before a purchase (just like buying first scope really in my opinion) and whether they will primarily use handheld at 1x and anything in between up to very large scopes with long focal lengths. I like the pod approach to mod 3 though. You can have both. I also wonder if you used a pair of BV's in a shortened tube scope with fast focal ratio, that you couldn't use the mod 3 in a BV. Half the available light, but still could zoom in to objects much more than 1x, 3x, 5x, etc. Eddgie, have you tried plopping the mod 3 with a 1.25" nosepiece on each housing into a BV? I experimented with a BV in my AT72 ED, but really need to try more in my 6" refractor. It needs a lot of light and still needs OCS to focus as the tube is stock length. One of these nights I will experiment more with my two mx10160 tube monoculars, the BV, and a much bigger scope than a 72mm. I saw it, but as Vondrogginnoggin mentions, none of these options has C mount (though likely that some C mount adapter would fit some of the goggles, though I am not sure of that). So they threw a link out there with a hand full of devices, but really did nothing to educate a potential buyer about the full range of application. (And the page is probably there because I talked to this guy several times looking for a high spec PVS-7 and explained that my primary application was astronomy. I had mentioned that I thought more people would in the future be using NV, and I guess he just thought that web pages are cheap, and why not have a page showing stuff and say well, you can sit in a chair and look at the stars). A nice thought, but poor execution. He probably does not have a clue as to the full extent of the device utilization in this context). They start with "gen2+" which is not ideal, they could throw in a 1.25" adapter and long pass filter cheaply and maybe a 12nm hydrogen alpha filter. Instead the only indication is the title only.... doesn't really help people... as we know adding filters is where the magic happens. Eddgie, Excellent post. I like your posts that balance the pros and cons. VND, I remember when you proposed using 2 monoculars with a binoviewer, and the idea has grown on me. Here is why. The main disadvantage of the PVS-7 is resolution. And its main advantages are its biocular output and its adaptability to various objective lenses due to its single input. So, what we need is a single input device, with biocular output and higher resolution. Now, I have a similar problem with my eyes. I have floaters, which appear similar to the imperfections in an intensifier tube. If I close one eye, I see floaters. But if I look through both eyes, I don't see floaters, and my resolution is improved. I am wondering how much resolution would be gained by using two tubes with a binoviewer. Would two 64lpm tubes be better than a single 80lpm tube, for example? Could two $1000 tubes give a better combined resolution than one $3000 tube? Now, I know that driving two tubes from a single source means each tube will only be getting half the available light. But wouldn't it be more practical to drive two tubes with one 6" objective and a filter, than use two 4.25" objectives and two filters? Edited by Rickster, 28 September 2016 - 11:24 PM. Its really a wash. The weight of two 4.25" scopes vs one 6" plus BV. They might be around the same if comparing refractor to refractor or newt to newt. The real bonus from BV's would be a greatly shortened tube and use the BV's specifically with tye shortened tube scope so as not to require an OCS and still have sufficient focus room. But yes, resolution is improved with two eyes, but then more aperture = better resolution too. At some point going larger in aperture will mean more weight for resolution than two eyes gets you with smaller aperture. All up to the individual on setup comfort. 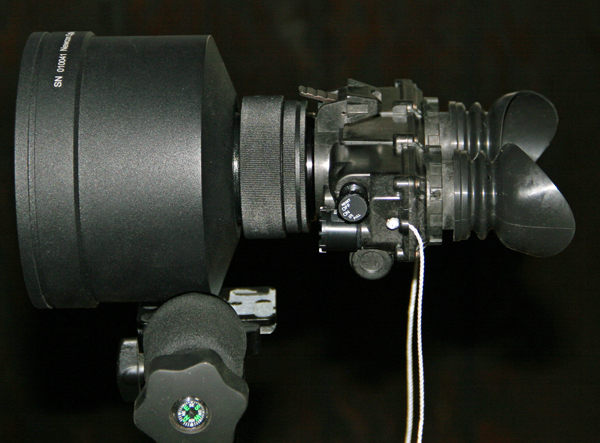 Using a large biocular eyepiece will also get you two eyed resolution, but in a single monocular. In 25mm tube devices, it's not that difficult to find a device that has a biocular single lens eyepiece, but nothing I've seen other than the BIPH has that for 18mm tubes. Both devices can take the same tubes, but as you can see, they are pretty big and much more weight than an 18mm tube device. 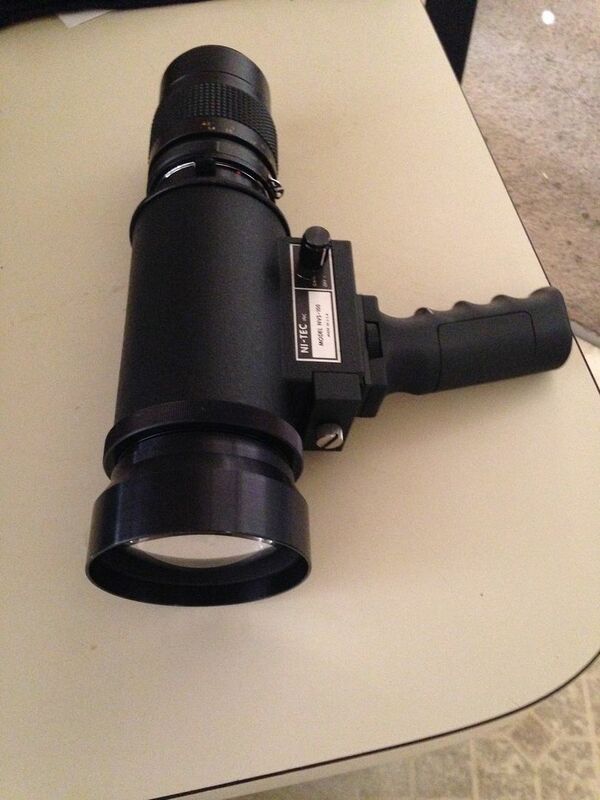 If I think about it though, it might come close to the weight of a BV with two 18mm monoculars in it. Edited by Vondragonnoggin, 29 September 2016 - 12:20 AM. One 6" lens is much better than two 4.25" lenses because our interpupillary distance limits objective lens diameter of straight through optics to about 60mm diameter unless porro prisms are used. This then requires a new heavy duty hinge complete with a means for adjusting collimation (which becomes more and more difficult as magnification is increased). Matsumoto's EMS bino backs - no porro prisms needed. I think the Biocular and Gen 3 PVS-4 tube would indeed be an amazing setup. I have looked on and off for the necessary parts to put this together for telescope use. The much larger field stop really appeals to me. 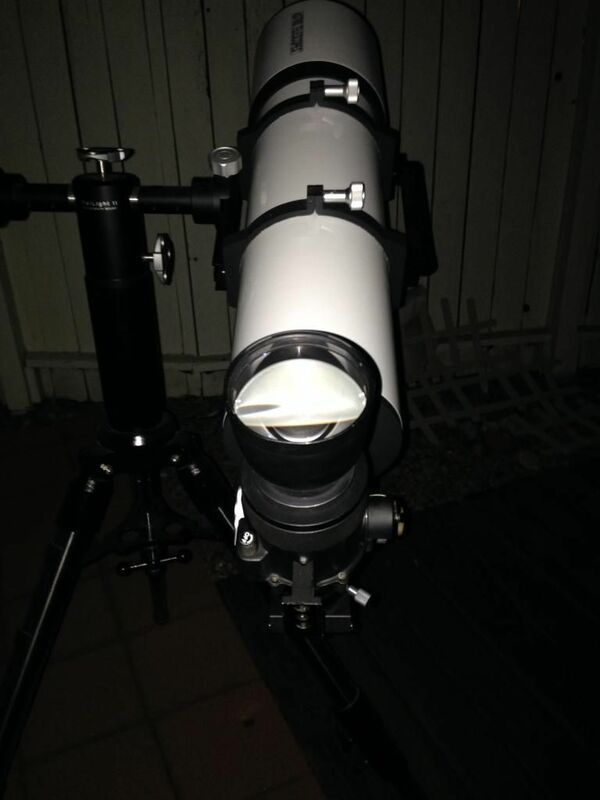 Binoviewing with image intensified eyepieces I don't think works as well as just using a PVS-7. Very good used PVS-7s turn up often for well under $2K. For someone that will use it primarily in in a telescope though, I think the Biocular and 25mm tube would totally rock. it is on my list of things to get. I may have to sell off a PVS-7 to do it though... LOL. Well Ed.....You just need to buy that 18" binocular telescope! EMS weigh more and cost more than porros. With my limited experience, I am thinking the 200mm telephoto may be the optimum NV attachment. Why? True field. Since we are all “contaminated” as telescope users we immediately think of throwing ever larger apertures at our NV eyepieces. Larger aperture = larger focal length = less True Field. One of NV’s unmatchable strengths is access to large HII features. Too much focal length ... can’t frame them anymore. Hence, the 200mm telephoto (which can be had in the f/2.8 range cheaply) may be the best balance of magnification and True Field. A few years ago I seriously considered making a large binoscope. I read the sagas of the guys who had already done it, and how an EMS could be used to solve the IPD problem. One of the more forthcoming guys reported that despite the extra expense, time and trouble that he had gone through to deal with IPD, collimation etc, his results with two scopes were no better than if he had used one larger scope and a binoviewer. He recommended that anyone considering such a project just go buy a binoviewer and be done with it. That made sense to me and I followed his recommendation. I have both a 200 2.8 lens and an 8X f2 catadioptric lens and I find the cat to be better but while a 200mm camera lens can be used with any C mount the cat is specific to a PVS-7. I inow which cat lens you are referring to. Very nice. 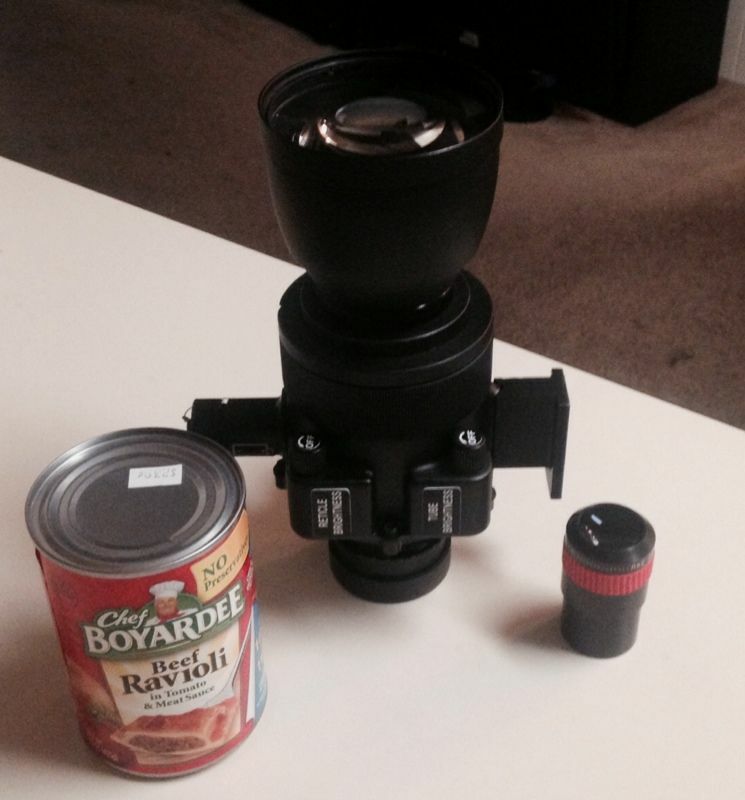 Thats a big lens too. How is the weight with the 8x? It is at the upper limit of hand holdable for me but I normally use it on a light tripod with a gimbal style head. Wow, that's one drool worthy lens, does it go on top of the regular lens of PVS-7 or it directly attaches to the PVS body?